In light of Korean-German Chamber of Commerce and Industry (KGCCI)’s 35th anniversary, more than 100 German and Korean business leaders and officials came together in Seoul to discuss and share insights on Korea’s economic trends and outlook. At the second Half-Year Economy Outlook 2016 conference hosted by the Korean-German Chamber of Commerce and Industry, President Stefan Halusa highlighted some recent and upcoming developments, which will have an impact on the world trade and the future of trade agreements. BREXIT and the risk of a continuation of the refugee crisis following the failed military coup in Turkey and the further escalation of the situation in Syria. Territorial disputes in Asia, and the presidential election in the USA, where both candidates have stated their skepticism towards free trade agreements. Korea’s economy largely depends on exports, so from his perspective Korea has a vital interest in free trade, and the fair implementation of such agreements. The recent upgrade of Korea’s credit rating by Standard & Poor’s demonstrates that there is confidence in Korea’s current and future economic performance. of certain industries and companies. Alexander Hirschle, Director Korea of Germany Trade & Invest, said that despite decreasing exports to China and low private household consumption, FDI into Korea especially from Europe will increase in the upcoming months according to official projections. He also pointed out the emerging strength of the Korean cosmetics industry and IOT-sector which both show enormous growth potential. Dr. Woo Cheonsik, senior fellow at KDI gave a presentation about his views on the long-term perspectives of the Korean economy. For him, Korea’s globalization potential has to be still further developed to seek new opportunities for connection and collaboration. Such can be in form of further FTA’s, FDI or new geo-political constellations but. He further went on to also emphasize the importance of the North-Korean situation. He pointed that a possible Korean unification would increase growth potentials of the peninsula and thus concluded, that in the long-term Korea’s economy would benefit from it. structural changes between Economy, Politics/public sector and Science. KGCCI will also show its own efforts to foster and promote innovative ideas and companies in Korea. The Chamber is going to award innovative companies in Korea during the KGCCI Innovation Award Gala at the Floating Islands on the Han River on Sept. 30. 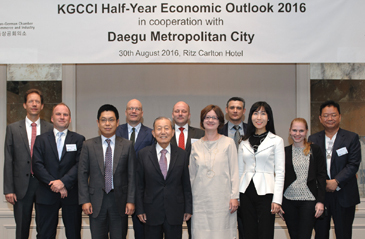 The Korean-German Chamber of Commerce and Industry (KGCCI) has been promoting economic relations between the Federal Republic of Germany and the Republic of Korea since its foundation in 1981. With around 500 members from various industries, KGCCI is the second-largest bilateral Chamber in Korea.